This page contains all the information available for Heliolisk in Pokemon Ultra Sun and Moon including all moves (LV, EGG, TM, and Tutor Moves). Dry Skin Restores HP in the rain or when hit by Water-type moves. 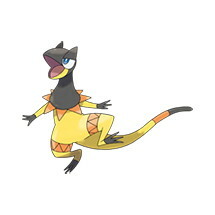 Reduces HP in sunshine, and increases the damage received from Fire-type moves. Sand Veil Boosts evasion in a sandstorm. The Pokémon gains an immunity to sandstorm damage. Solar Power Boosts the Special Attack stat in Sunny weather, but HP decreases every turn.